We're celebrating the season with some of our favorite Christmas movies. 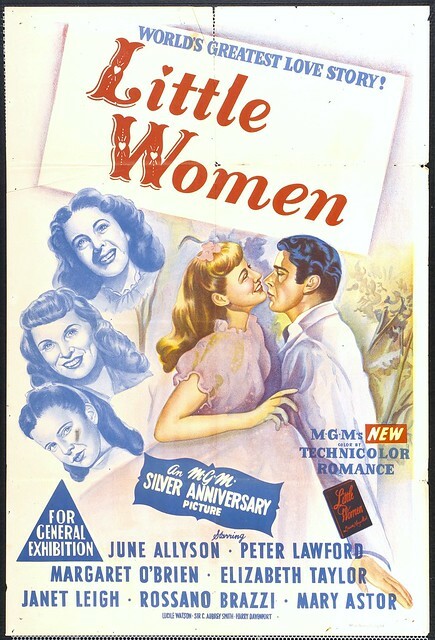 This week's selection is Little Women from 1949. MGM's adaptation of Little Women is one of the most delightful family films produced in Old Hollywood. Little Women tells the story of the four March sisters who are growing up in New England during the Civil War. 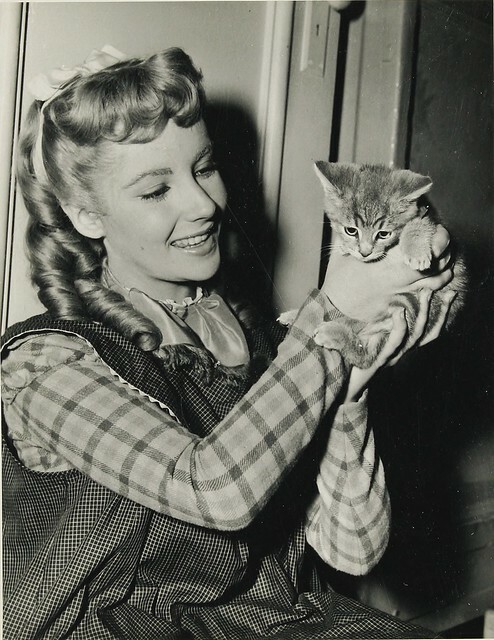 The main character is the second eldest sister, Jo (June Allyson), an impulsive tomboy who dreams of becoming a writer and traveling the world. The other sisters are the sensible Meg (Janet Leigh), dreamy Amy (Elizabeth Taylor) and innocent Beth (Margaret O'Brien). 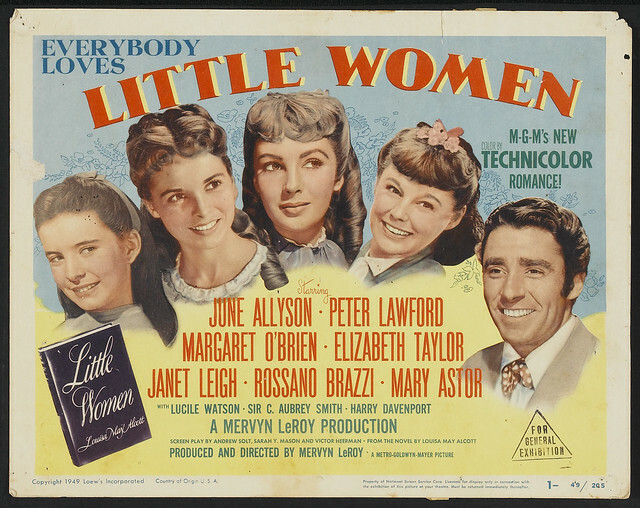 Little Women follows the girls through the years as they experience triumphs and tragedies while growing up under the watchful eye of Marmee (Mary Astor). The film is not exclusively set during the holidays, but there are many Christmas scenes, most memorably when the sisters give back their own presents to buy something for Marmee. 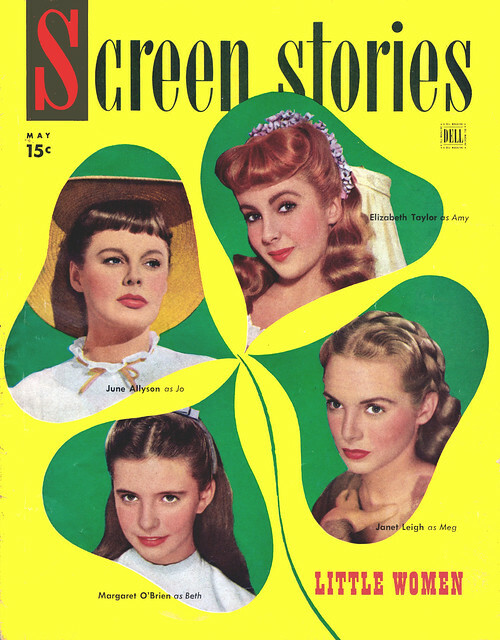 The four March sisters appear on the cover of Screen Stories. Little Women is adapted from Louisa May Alcott's 1880 children's classic. The novel had already been successfully brought to the screen in a 1933 adaptation directed by George Cukor and starring Katharine Hepburn. Producer David O. Selznick thought it was time for a second version and he scooped up the rights in 1942. Selznick was known for his lavish films based on famous literature--David Copperfield (1935), Gone With the Wind (1939), Rebecca (1940)-- and he planned an all-star re-make featuring Jennifer Jones and Shirley Temple. 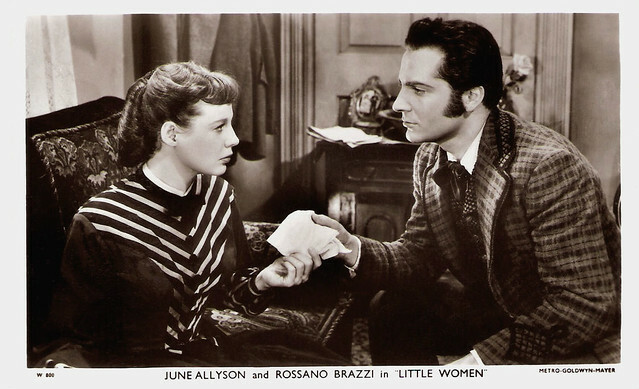 Eventually, Selznick scrapped plans for Little Women when he decided to take Jones' career in an entirely different direction with Duel in the Sun (1946). 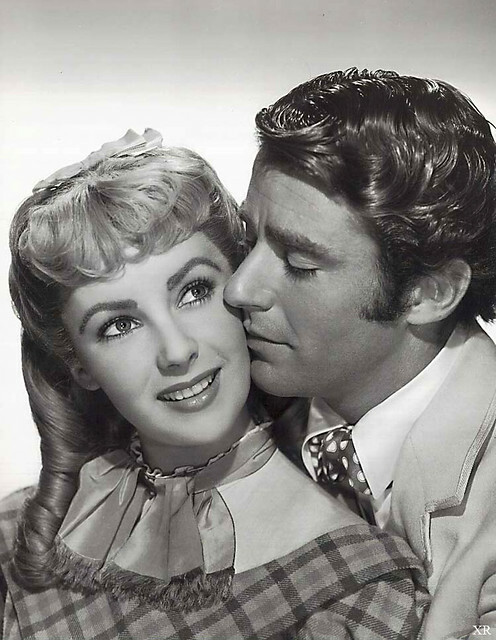 Elizabeth Taylor and Peter Lawford in a publicity still for Little Women (1949). The script was eventually sold to MGM where director and producer Mervyn LeRoy picked it up. In many ways, Little Women is a spiritual sequel to MGM's 1944 smash hit, Meet Me in St. Louis. Both films follow the lives of four sisters who live in Victorian America and even much of the cast is the same. Leon Ames and Mary Astor repeat their roles as the parents and Margaret O'Brien again plays the youngest child in the family. Also, Harry Davenport, who played the grandfather in Meet Me in St. Louis, plays Dr. Barnes in Little Women. Little Women's scene stealer is 17-year-old Elizabeth Taylor as the second youngest daughter Amy (this is changed from the book where Amy is the youngest daughter). Taylor had previously played mostly saintly types, but Amy, who longs for the finer things in life that the impoverished Marches cannot afford, gives Taylor the chance to play a showy role and she makes the most of it, whether she's wearing a clothespin on her nose to improve her looks or maneuvering behind Jo's back to go with Aunt March (Lucile Watson) on a European vacation. Little Women has been adapted several times since 1949, most notably in a 1994 version directed by Gillian Armstrong and starring Winona Ryder. The 1994 version is the most faithful to Alcott's vision and Katharine Hepburn will always be the iconic Jo, but the 1949 version still holds up well. It is a delightful family film with a wonderful cast that can be enjoyed by viewers of all ages. Little Women is available on DVD and video on demand. Our other top Holiday picks are Christmas in Connecticut and It Happened on 5th Avenue.